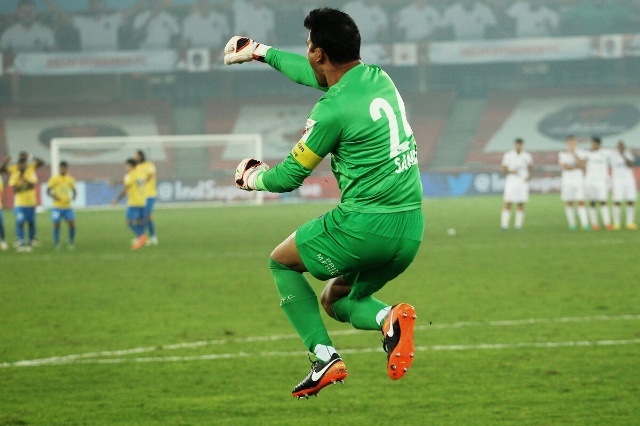 DELHI: Goalkeeper Sandip Nandy emerged an unlikely hero for Kerala Blasters against Delhi Dynamos FC and ensured his team’s passage in the final of Hero Indian Super League here on Wednesday. Delhi Dynamos were leading 2-1 during regulation time and were tied 2-2 on aggregate in the second-leg semi-final at Jawaharlal Nehru Stadium here. The extra time failed to break the deadlock and in tie-breaker, Nandy proved Kerala’s saviour as Delhi failed to get the better of him with their first three penalties, taken by Florent Malouda, Bruno Pelissari and Memo. Kerala Blasters, who had won the first-leg semi-final 1-0, scored through Josue Prieto, Kervens Belfort and Mohammed Rafique with Antonio German’s miss counting for nothing as Kerala won 3-0 and earned the right to play Atletico de Kolkata in the grand finale in Kochi on Sunday. Incidentally, both teams had contested the final of the inaugural ISL in 2014. Earlier in regulation time, Marcelinho Pereira (21st minute) and Ruben Rocha (45th minute) scored for Delhi Dynamos, while Duckens Nazon was the goal-scorer for Kerala Blasters in the 24th minute. Delhi led 2-1 at half time. The loss will be hard on Delhi Dynamos who had created far more chances than their rivals despite playing more than 90 minutes with a player short. Delhi midfielder Milan Singh was sent off in the 28th minute but the hosts played with renewed vigour and did not allow the player handicap to disadvantage them. With a win under their belt from the first leg, Kerala Blasters made just one change as coach Steve Coppell brought in Didier Kadio for goal-scorer Kervens Belfort. The Kerala coach may have been left to rue his choice as it was Kadio’s clearance that led to the first goal. In the 21st minute, a long ball from Marcos Tebar was cleared away by Kadio but the ball only fell for Marcelinho inside the box and the Brazilian made no mistake slamming the ball into an empty net. Kerala reacted well to that setback and equalised just three minutes later. Josu Prieto did well to hold on to the ball and then release it for Nazon. The Haitian took Anas Edathodika in his stride, then left Ruben Rocha on the wrong foot and let go of a screamer which goalkeeper Antonio Doblas could only watch helplessly sail into the goal. Delhi Dynamos were rocked further when they were a player short in the 28th minute. Milan Singh was pulled up by the referee for a challenge on Mehtab Hossain and was promptly sent off. Despite having a player disadvantage, it were Delhi Dynamos who had the last laugh in the opening 45 minutes after Ruben gave his team the lead again in added time. A freekick from Tebar saw Ruben rise high and sneak the goal home even as goalkeeper Sandip Nandy missed the flight and defender Kadio couldn’t head it away. Delhi were leading in this game but the teams were tied on aggregate which meant both teams needed another goal. That goal did not happen all through the 90 minutes but it were Delhi who clearly enjoyed the upperhand. Delhi infact can count themselves unlucky as defender Sandesh Jhingan proved to be Kerala’s saviour with a timely goal-line clearance. Kerala, on the other hand, had their chances with Antonio German firing a long ranger wide from a good position and CK Vineeth’s diving header missing the target. In the first half of extra time alone, Delhi came close several times to scoring the goal that would have mattered. Florent Malouda was the man in form and he forced goalkeeper Nandy to make two good saves. Once, Nandy’s save saw the rebound fall for Marcelinho but his attempt sailed just wide of the target. Another Marcelinho header from close range fell into the waiting hands of the goalkeeper.